And - in todays traffic there should be the described assistance for a safe change. A driver from East Europe without money or a driver in hurry could try to change a tyre without such assistance in heavy traffic -- could end with a deadly accident, So better not to enable this possibility. I quite agree, Ralf. It's essential. I was not implying that a driver should do the job himself, unaided. What I was saying was that if spares were carried then the chap coming out to do the change-over would not be bringing the wrong one. normaly trucks do have a spare,so we can change them by ourselfs,no problem with that,beside of a lot haevy work. there was a miscomunication now about the size,this was also the first time this happend to me. Yes, Thijs, I see what you mean about being unable to carry spares. but for a short trip it's oke to drive,knowing that the way of breaking will be weird,have to steer against,while breaking he want to go left,so i have to steer to the right to keep in line of the road. And in those 20 Km, even if "just highway", an accident can happen just as easily. That is false reasoning, isn't it? An accident needs only a relatively small length of road in which to happen. And with that weird steering you'd be lucky to get out of it unscathed. for ''normal'' driving for this short distance it's oke,not if you have to drive hundreds of kilometers,thatswhy we went straight away to the tyre specialist for chance them again. i know that it issn't right to drive like this,so you drive a little more carefull,some more distance,looking further ahead,no fast steering manouvres. i Always remered the dead off a dutch truckdriver years ago late 80's,Ralf knows that spot. coming out of the tunnel of the A81 it that time the old tunnel higher up the mountain,in direction of leonberg dreieck (Tcross of highway). you see,i'm not the only one,driving and making pics. Last edited by janihudi; December 14th, 2013, 12:51. Now you wouldn't get my E.S. 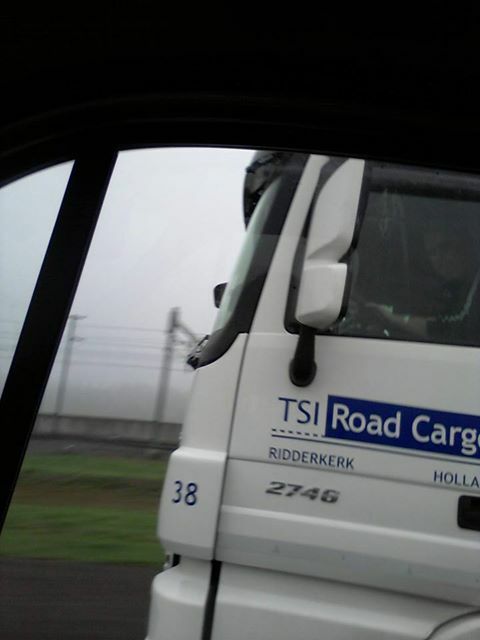 driver doing that! no.but he has an Ivy. Eddie Stobart's don't need Ivy's to keep them in order! Oh well, I guess Dutchie is just not interested. Won't bother next time. Bah! pick up the highway cruiser this evening,so 2 days of cleaning an stuffing a cab. i hat this weekend ,before it's started. Yes, I can imagine how you feel. You have had such a lovely long break this Christmas, Thijs, it's been good, hasn't it? And you've got so much done with your modelling, it's been great to watch and to see you about the forum. day 1 is done,it's clean (inside) al the junk is clean and in the cab, vacuuming the carpet (long and heavy),tomorrow the tiger carpet beating out for the dust,placing the curtain hooks and hang them back. and at the outside i'm planning to polish the chrome roof lightbar,the airhorns and some other chrome parts. Do you have room to park the Cruiser at home for the big cleaning? It might be fun to work on if it is right there at home but if you have to drive across town it might seem like work. it's just the truck,not the trailer with me. but when there is 1 car parked in the narow entrence,i can look them up to park somewhere else,or make another round over the little square. sowhen i came back Friday and parked it on the Industrial estate driving with my own car on the square i see that there was a lot of space,so went back to the truck and parked it already Friday eve here,so this afternoon he wil go back to meat his friend ,the trailer. Then this evening you enjoy a few last hours of freedom!